Home / Entertainment News / Don’t let SHARON’s death scare you, continue dating SPONSORS - NICOLE tells Kenyan LADIES and gives them rules of the game. 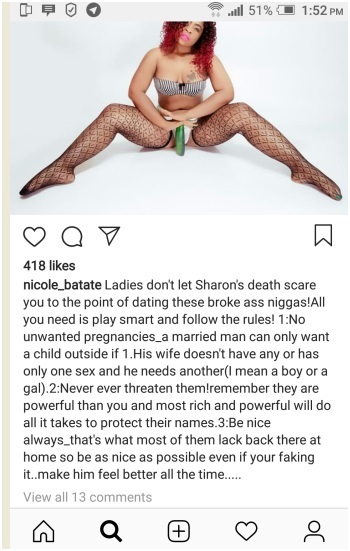 Don’t let SHARON’s death scare you, continue dating SPONSORS - NICOLE tells Kenyan LADIES and gives them rules of the game. Monday, September 10, 2018 - The death of Sharon Otieno who was brutally murdered and her body dumped in a forest has elicited a lot of reactions online. Everybody seems to have his or her own opinion concerning her death. While some people are advising young ladies to avoid sponsors after Sharon’s death was plotted by her sponsor, Okoth Obado, this struggling Nairobi socialite called Nicole Batate is telling ladies to continue servicing sponsors. According to Nicole, Sharon’s death should not scare ladies away from dating sponsors and start tolerating broke men.